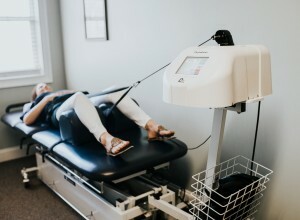 Non surgical spinal decompression is a form of traction or stretching that can be used in both the lower back or neck to create a negative or a decompression force in your spine designed to relieve pain! Spinal decompression is primarily designed to help disc injuries. It does this in two specific ways. First imagine a disc as a jelly doughnut with an inside material the jelly that is held in by a more solid outer material your breaded portion. When a disc is injured it will begin to bulge or even herniate (think of the jelly leaking out of a doughnut). That disc material bulging or herniating out into nerves can cause a tremendous amount of pain, numbness and tingling, weakness and some times even more serious symptoms. Getting the disc material or jelly in our example back to its normal position is very difficult. Decompression is one of the most successful ways to do this. By isolating this region and creating a stretching force we can create a negative pressure in the disc which acts like a vacuum sucking the extruded material back into its normal position. 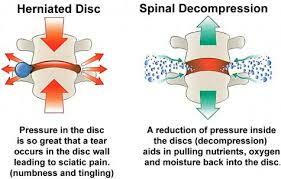 The second way that spinal decompression is helpful in disc recovery is by creating increased blood flow into the disc. Spinal disc have terrible blood significantly decreases the ability for them to heal. Blood flow is essential to the healing process in our body bringing in all the nutrients, repair tissue, and infection fighting agents to heal injured tissue. Without good blood flow into the disc this process is decreased significantly. Decompression with its pulling and stretching mechanism creates a process called imbibition, this process allows blood flow to flow into the disc and increase the healing process thus allowing your disc to repair faster. - Numbness and tingling in feet or hands. Call today at 678.494.9668 to discuss how spinal decompression can help you.